Students will explore the world of gardening and learn how a greenhouse functions in order to extend the growing season. They will be able to grow their own basil, analyze existing recipes using this ingredient, and use this information to create their own recipes. Students will investigate and understand basic basil anatomy. They will make distinctions between the different ingredients needed to make a salad dressing based on observations. 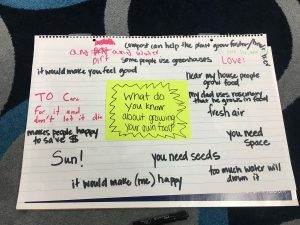 How does a community garden impact the community? What are the differences between store-bought products and locally grown and harvested products? These two goals reinforce the existing Campbell Outdoor Classroom/EL Education programs, as well as existing farm-to-table outreach. This project is designed to grow this impact beyond Campbell's walls by providing fresh basil and the Big Bad Basil vinaigrette to Kenmore Middle School and Carlin Springs Elementary. 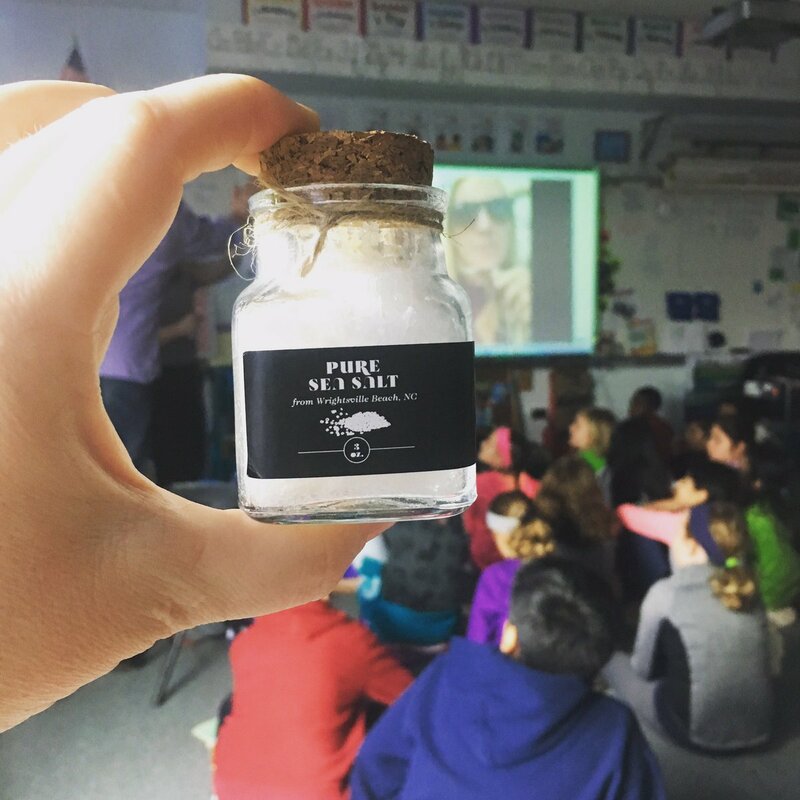 Academically, the impact includes reinforcing Science skills such as scientific investigation, reasoning, and logic via explorations of plant life cycle. Language Arts are reinforced with comprehension of non-fiction texts, writing cohesively, persuasive writing, and media analysis. This expedition also brings the Art department into play as the students create marketing materials (posters and labels) for their vinaigrette. This farm-to-table project promotes sustainability throughout its life cycle. An Arlington Public Schools food services employee offered some extra basil seeds to Campbell's Outdoor Classroom coordinator, and the idea for this expedition sprang to life: take the donated seeds, grow them in our organic garden beds, make vinaigrette, and donate the vinaigrette back to other Arlington schools. 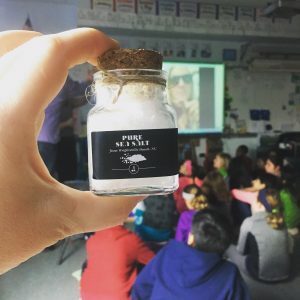 This full-circle sustainability and community growth will spark interest in farm-to-table projects and healthy eating in other schools, the very definition of sustainability. Students enjoy a fresh-picked morning snack of vegetables from the Campbell garden. The impact of gardening and cooking with children has been well documented (see Supporting Data section below), and Campbell's well-established school gardens and classroom cooking has borne out this fact. When children grow and cook healthy food, they are more likely to expand their palate and become more adventurous eaters. The garden and cooking farm-to-table program has a long history at Campbell Elementary. 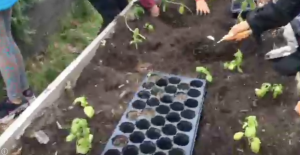 This Big Bad Basil project is not noteworthy simply because it is getting our kids out in the dirt to grow food and cook—we've been doing that for years. Big Bad Basil is noteworthy because it expands our existing farm-to-table projects beyond Campbell itself. New for this project is a fieldwork visit to the Academie de Cuisine, a virtual FaceTime field trip to the Sea Love Sea Salt farm, formal recipe development yielding a recipe to be used by the APS district food services, and donating a prepared and bottled product to other Arlington schools to spread interest in sustainable farm-to-table school projects. 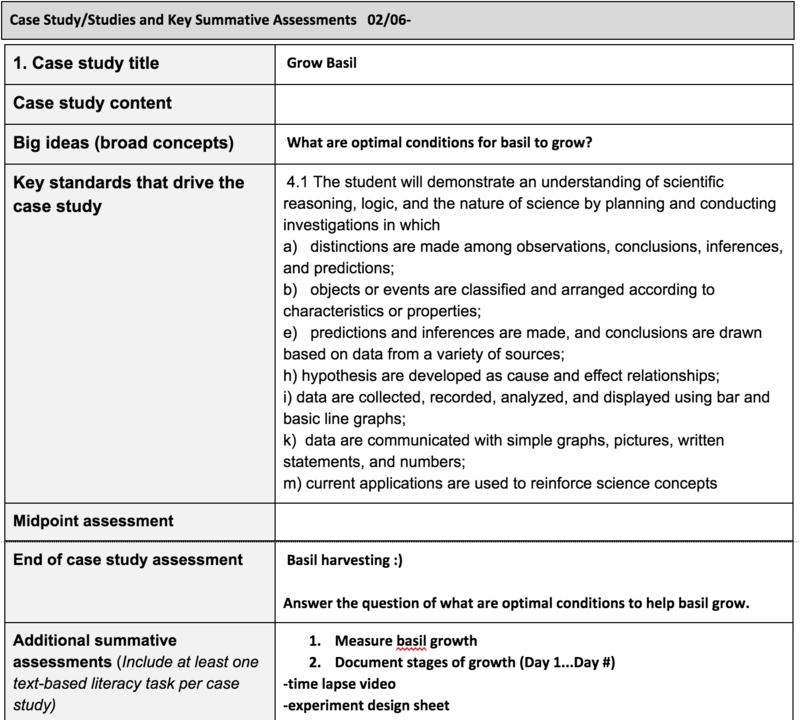 A section from the Expedition (Lesson) Plan covering the impact and service learning components, as well as tie-in to existing Campbell greenhouse project. 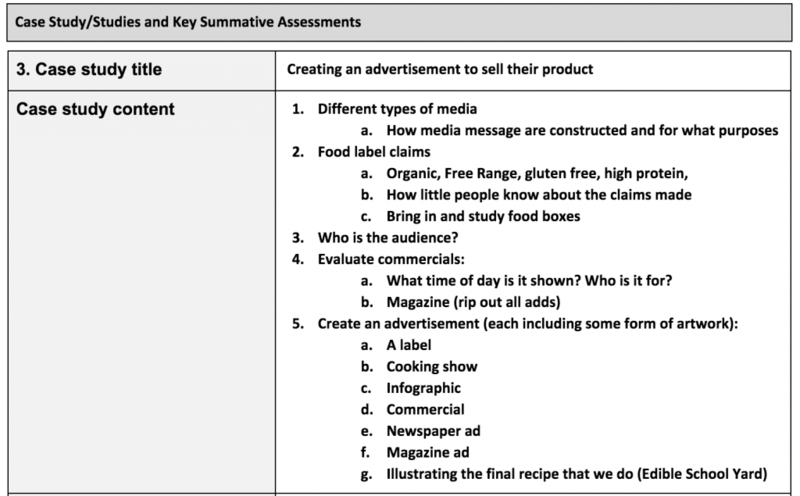 A section of the Expedition (Lesson) Plan showing a media analysis/Language Arts/Art component of the project. This expedition is still under way, so we do not have final results for quantitative impact yet. All Campbell fourth graders will take part in this expedition. All students at Campbell will have the opportunity to enjoy the end product: bottled Big Bad Basil vinaigrette. Kenmore and Carlin Springs will receive bottled Big Bad Basil vinaigrette to serve to their students. Bottles of Big Bad Basil vinaigrette will be donated to Campbell's Wetlands Festival Silent Auction to raise money to support the wetlands and outdoor classroom.